Allosaurus was a common carnivorous (meat-eating) dinosaur in North America during the late Jurassic and early Cretaceous period, approximately 154 to 135 million years ago. Allosaurus fossils have also been found in Africa and Australia. Allosaurus was up to 39 feet (11.9 meters) long, and weighed approximately 1.7 tons. Some scientists believe Allosaurus was too heavy to chase down prey, and therefore was probably a scavenger. However, others believe that Allosaurus may have been quite agile, and could even have hunted in packs to bring down giant herbivores (plant-eaters) such as Apatosaurus or Diplodocus. The first Allosaurus fossil was incorrectly described as a "petrified horse hoof". In fact, it was a caudal vertebra (tail bone) of this dinosaur, although it was not recognized as such at the time. Using much more material, including a partial skeleton, Othniel C. Marsh published the first description of Allosaurus in 1877. One of the most important Allosaurus specimens found, was discovered in Wyoming, in 1991. This animal, which has been nicknamed "Big Al", was actually smaller than average for its particular species of Allosaurus (it was probably not fully grown), and even though many bones showed signs of infection (which may have contributed to the animal's death), was very important because the skeleton was 95% complete. Furthermore, the same team which discovered "Big Al", also subsequently discovered a second well-preserved specimen, which has been nicknamed "Big Al Two". The discovery, and possible life-story of "Big Al", served as inspiration for a special episode of the BBC/Discovery TV series, Walking With Dinosaurs, entitled "The Ballad of Big Al". Allosaurus has been designated the official state fossil of Utah, since 1988. 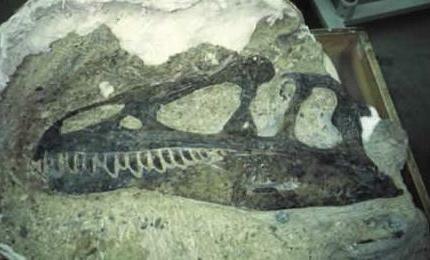 Fossilized Allosaurus skull at Dinosaur National Monument. African Dinosaurs - Allosaurus lived in North America, Africa and Australia. Australian Dinosaurs - Allosaurus lived in North America, Africa and Australia. North American Dinosaurs - Allosaurus lived in North America, Africa and Australia. Allosaurus was a genus of dinosaur. "Allosaurus" means "different lizard" or "strange lizard". This name was chosen by Othniel C. Marsh in 1877. 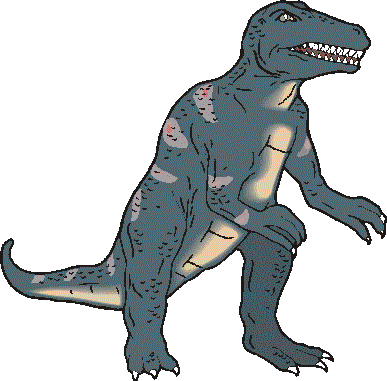 Allosaurus was a member of the Saurischia ("lizard-hipped") order of dinosaurs. What this means, is that although Allosaurus was not closely related to lizards, it did have similarly shaped pelvic bones. Allosaurus was a Theropod - a member of a group of related bipedal dinosaurs that included the ancestors of birds (although Allosaurus was not itself an ancestor of birds). Allosaurus lived between about 154 million years ago and 135 million years ago, during the late Jurassic and early Cretaceous periods. Allosaurus was a carnivore (meat-eater). Some scientists think that Allosaurus was probably a scavenger, but others think it was an active predator. There is even possibility that Allosaurus may have been a pack hunting animal, with individuals working together to bring down prey. Allosaurus was about 39 feet (11.9 meters) long. Allosaurus weighed about 1.7 tons. Allosaurus is the official state fossil of Utah. Provides information about allosaurus, whose name means "the different lizard" because of its backbone, and the way it hunted. We have created an activity book full of these dinosaurs creatures and we need your help to complete it! Every Dinosaurs Activity Book picture is printed on its own 8.5 x 11 inch page. Make one of the best decisions for your child this year. In a lively mix of science and stunning visual images, the life story of a male Allosaurus, whose remains were discovered in Wyoming, follows his tough life from his early days beating out bigger dinosaurs for food to the fierce battles he fought as a teen. Original. In Abbeville's Dinosaurs series, a talented artist and a noted paleontologist have teamedup to re-create the vanished world of the dinosaurs in comic-book form. Each volume inthe series tells the action-packed yet scientifically accurate story of a different dinosaurliving in its particular time and place. At the back of each volume, meanwhile, are severalshort essays, abundantly illustrated with original drawings and photographs of fossils, thatexplain more about the creatures and settings encountered in the comic. The Hunting Pack, the third title in the series, depicts life in a group of Allosaurus inthe late Jurassic period, 150 million years ago, in what is today western North America.As these powerful predators hunt herbivores like Camarasaurus and Stegosaurus, anaggressive young Allosaurus challenges the battle-scarred dominant male for leadershipof the pack. The essays at the back of the book explore the comic's remarkable setting,the ancient ecosystem of the Morrison Formation, located in what is today the westernUnited States and Canada. Long ago, a once-mighty Allosaurus stalked the land searching for helpless prey for dinner, too sick to battle stronger dinosaurs. Millions of years later, scientists discovered the bones of this 'different lizard' in Wyoming and named him Big Al. Read how Big Al helped them learn more about Allosaurus and its days on Earth. This fast-paced narrative in graphic novel style format will grab your readers' attention as they learn about the Allosaurus, which weighed up to 4 tons. Bewitching photos and graphics with vivid colors enhance the fact-filled front and back matter of this exciting book. My Dinosaur Alphabet is a fun and imaginative way for young children to learn their alphabet and some new words. Colourful illustrations make this book fun to read and learn. Series 1 (A to H) follows 8 dinosaurs, as they go on an adventure to find things beginning with their initial letters, and they ask for the reader's help in doing this. We make friends with Adam the Allosaurus, Bianca the Brachiosaurus, Carley the Compsognathus, Daniel the Diplodocus, Esmerelda the Edmontosaurus, Felicity the Fabrosaurus, George the Gallimimus and Harry the Hadrosaurus. This book is aimed at young children from 2 to 6 years of age, including young ESL readers. It is written by an author who is a qualified teacher of English as a second language, so is in a format that is easy to read and understand. Your child will enjoy 'stomp, stomp, stomping along' with the different dinosaurs to see what they can find. Each of these individual stories has been released as a separate eBook, but this compilation allows you to purchase this at a much reduced price, so it becomes more accessible for everyone. The individual books have featured in the best selling new releases in the Early Learning category for ebooks on Amazon over the last few months, so take advantage of this compilation book to help your child learn their alphabet at a competitive price. My Dinosaur Alphabet i to z will be released as individual ebooks over the coming months. 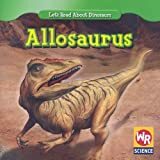 This title will help readers discover Allosaurus dinosaurs that lived in the late Jurassic period around 150 million years ago. Each title is complete with cool realistic illustrations, photographs of fossils, and a map of where Allosaurus fossils have been found. Aligned to Common Core Standards and correlated to state standards. Translated by native Spanish speakers--and immersion school educators. Abdo Kids Jumbo is an imprint of Abdo Kids, a division of ABDO. Relive the exciting adventures of the Jurassic World movies with this realistic Roarivore action figure! 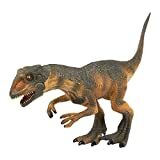 Featuring articulated arms and legs, realistic sculpting, authentic detail, and dinosaur sounds, this figure is a quality addition to any collector's toybox! Each figure also has its own unique attack move that is iconic to its respective species, such as wing-flapping, head-striking, and chomping. All Schleich figures are lovingly hand-painted with detailed modelling and allow children to learn as they play. Allosaurus was one of the largest carnivorous dinosaurs. BEAUTIFULLY FINISHED AND DURABLE - This figure is beautifully finished and the extreme attention to detail is universally recognised. This figure is made of a very high quality plastic and its measures approximately 10 inches long; Suitable for ages: 3+ Years. LARGE AND FEARSOME PREDATOR The name Allosaurus means different dinosaur. Living in the late Jurassic period, this dinosaur was a large and powerful predator with razor-sharp serrated teeth. Along with the Tyrannosaurus Rex, the Allosaurus has become the epitome of the huge, ferocious dinosaur in popular imagination. MADE WITH INDUSTRY-LEADING STANDARDS: All Safari Ltd. figurines have been individually hand painted with careful detail. They feature quality construction from BPA, phthalate, and lead-free materials to ensure your family's safety. PRODUCT SPECIFICATIONS Measures 7.1"L x 1.7W x 3.4"H. For ages 3 and up. The name Allosaurus means different dinosaur. Living in the late Jurassic period, this dinosaur was a large and powerful predator with razor-sharp serrated teeth. Along with the Tyrannosaurus Rex, the Allosaurus has become the epitome of the huge, ferocious dinosaur in popular imagination. 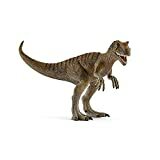 This figurine is part of the Dinosaur and Prehistoric Life Collection, which was designed for the dinosaur lover in us all. 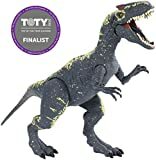 Like all Safari Ltd products, the Wild Safari Dinosaur and Prehistoric Life Carcharodontosaurus has been individually hand painted, features quality construction from phthalate and lead-free materials, and includes an educational hangtag in 5 languages. Realistic, educational, and fun, you can admire it on a shelf, use it in the classroom, or simply enjoy playing with it. Product measures 7.1"L x 1.7W x 3.4"H. Recommended for ages 3 and up. 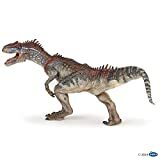 EXCELLENT SIZE FOR COLLECTORS AND KIDS-This realistic Allosaurus figure is about 25cm LONG and 9cm HIGH.This is a relatively large model, but one that can still be held comfortably by the hands of a small child. This terrifying model is dramatically posed and sure to impress children and collectors alike. GREAT DETAILS-Each HiPlay dinosaur model is hand-painted by proffesional painters.It has a realistic head and body with simulated skin. 100% MONEY BACK GUARANTEE FROM HIPLAY-HIPLAY is a global professional seller of toys and entertainment products.If you are not satisfied with the product, we'll also offer you a 100% money back GUARANTEE without any ask. -Made from high quality Plastic with CE certification. -Lifelike design with great detail. -Easy for holding, posing and playing. -Teaching young children about ancient creatures. -Wonderful collectibles for figure collectors. -Display in parties, exhibitions for decoration. 1. Fulfilled By Amazon:Shipped from Amazon warehouse, 2-5 days delivered. 2.Shipped by HiPlay: Shipped from HiPlay warehouse in CA, 5-12 days delivered. To provide our customers with the highest quality goods at the best price, sometimes we will manufacture or order the products from overseas factories, and we may ship them from our overseas warehouses directly. However, needn't worry about the international shipping time. We have our best international logistics partners--Transit from overseas ONLY TAKE 7-14 DAYS. -If you have any question about the products,just contact us by email.We'll try our best to assist you! 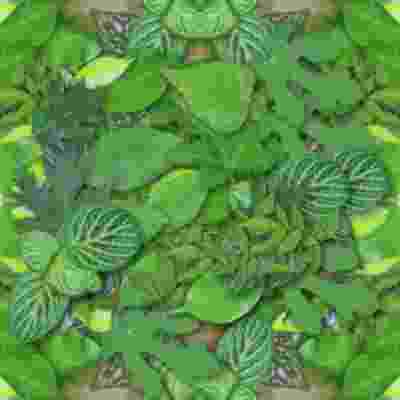 -If you're not satisfied with the products,we'll also offer you a 100% MONEY BACK GUARANTEE. HIPLAY, is an international toys and entertainment products brand , which has been recognized and adored by fans around the world. The HiPlay name was created by combining Hi with Play , represents the meaning of HI! PLAY JUST FOR FUN!. We hope that our products can bring more happiness to you.